Taking the topic of the headline of this post I want to share some reflections on the commercial aircraft market. 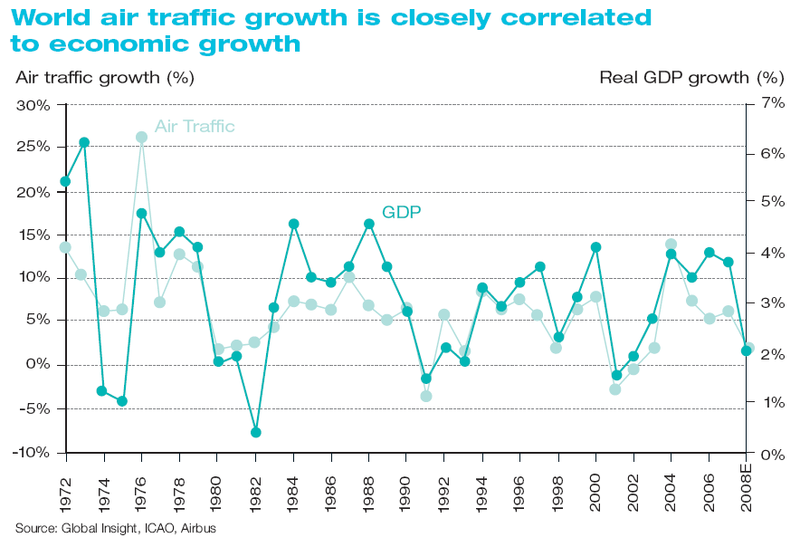 The first is how closely air traffic growth is correlated to world economic growth. This sentence and the following graphic are taken directly from the Global Market Forecast [PDF, 7.9MB] produced by colleagues at Airbus. 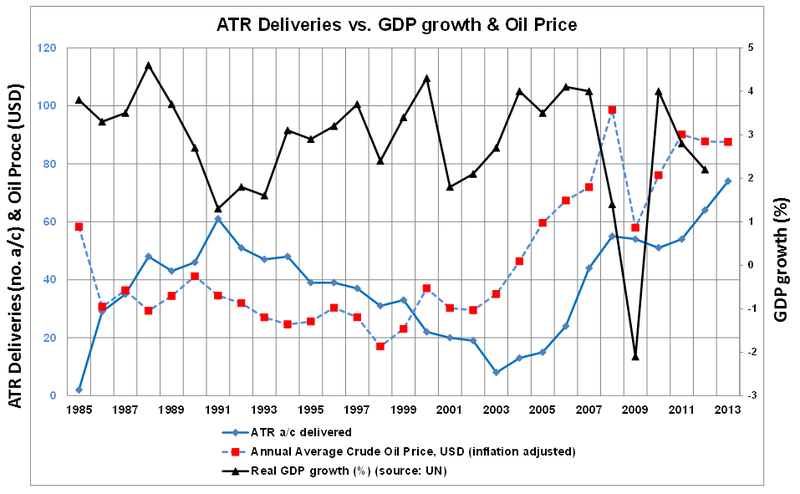 Air traffic growth vs GDP growth (source: Airbus). You may see in the graphic the correlation (correlation coefficient above 0.7) and how the air traffic growth is however much more volatile than the economic growth. This is very intuitive. The better the economic situation the more business trips, family visits and holiday trips will take place. Nevertheless Airbus explains that in some situations and regions this is not enough to forecast traffic and thus they produce hybrid models. Then, I wondered: how do airlines translate this growth in traffic into airplane orders? I made some numbers and played with them. I gathered aircraft orders for both Boeing and Airbus in the last ~20 years, plus air traffic and GDP growth over the same period of time. Then, I tried to connect one with another and see how best they would correlate with each other. Even though correlation does not imply causation, it may indicate existence of such causal relations that it’s why I searched for such results. 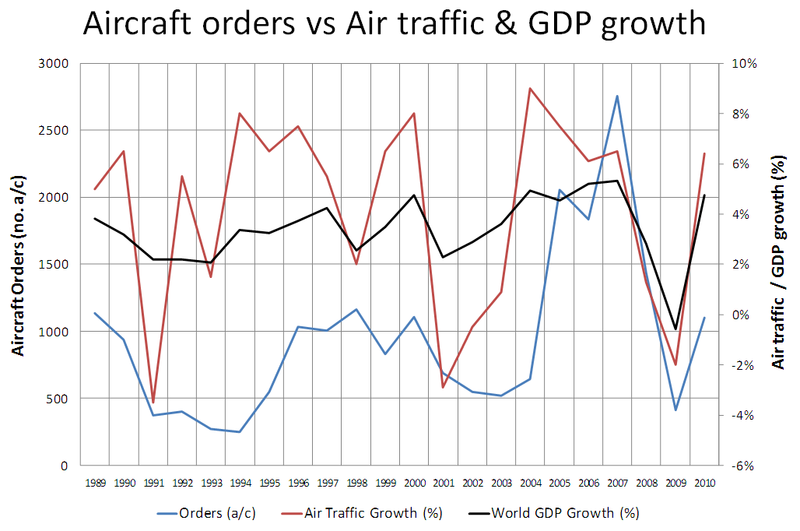 Aircraft orders vs. air traffic and GDP growth. One could expect that airlines, after collecting first hand data of traffic growth plus the aggregate demand from industry sources (IATA, ICAO) and after applying their complex planning models would order aircraft from manufacturers. Thus, a correlation might be expected between traffic growth and aircraft orders. What we don’t know is whether airlines would place orders in the same year where the traffic growth actually takes place or there would be a lag (due to the airline analysis process, the negotiation with the manufacturer, arranging the financing, waiting for the next air show…). The correlation results I got between these 2 variables are satisfactory though not that high. Matching data of the same year yields a 0.35 correlation coefficient. 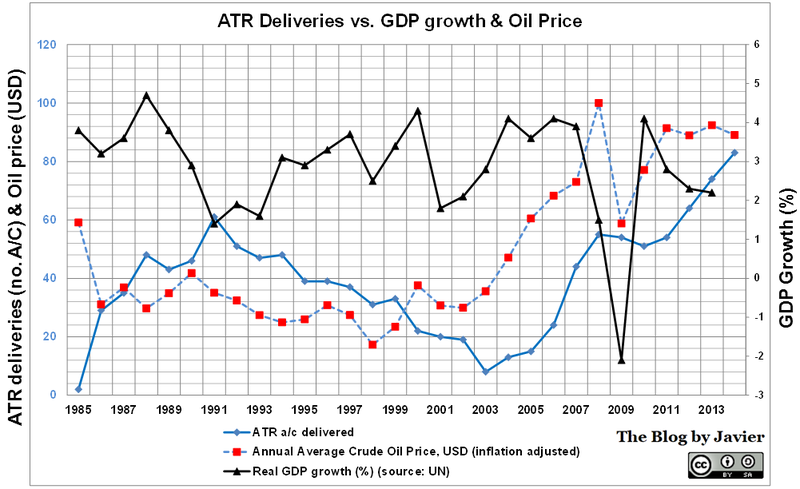 If however, we apply a 1-year lag in between air traffic growth data and orders the correlation is better, 0.44 (a lag of 2 years would worsen it down to 0.27 and so forth). 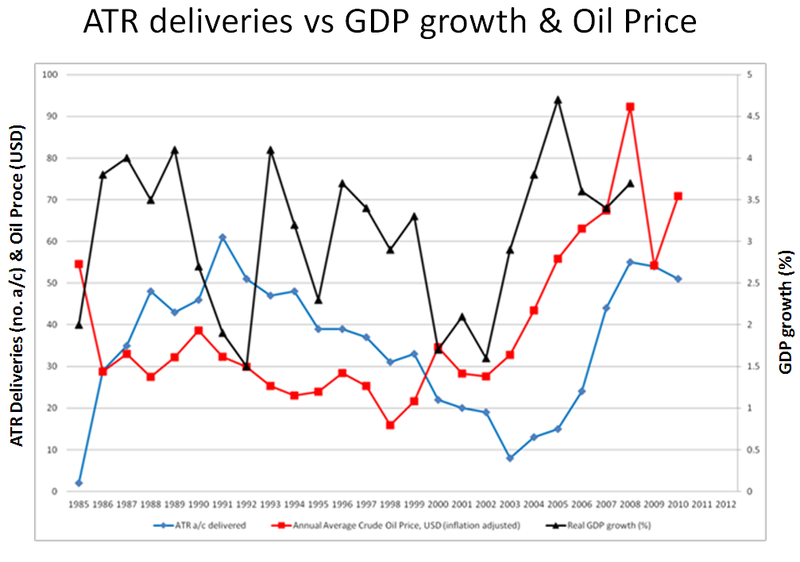 I found it curious that correlation between orders and GDP growth is much better! Matching data of the same year yielded a 0.61 correlation coefficient (which is rather high). 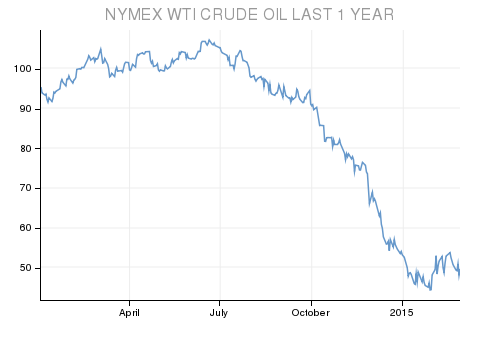 A lag of a year would produce a still high 0.56 (2-year lag, 0.41; 3-year, 2.6…). This was a striking result for me. After all, even though individual airlines do have complex models and experienced analysts behind them, taking the aggregate of the market, it seems that orders are placed less on data of traffic and more relying on data of economic growth, and rather soon, acting within the same year or a year later! Who knows how the process within the airlines actually works… I can imagine thoroughly thought and thick studies coming from planning & analysis departments being put aside in the board room where one or two directors (more assertive than the average) convince the rest of the soundness of an operation based half in broad economic prospects (world GDP growth) and half in gut-feeling… wouldn’t surprise me much.